Do you need healing from mother wounds? Do you also struggle to receive from God what YOU KNOW He has promised you–comfort, nurture, protection, fruitfulness? Also, do you believe in God’s promises–but you still find yourself feeling abandoned and having to fend for yourself? If so, the Lord has been showing me out of His Word that these things are related. This is GREAT NEWS, because it means you can BOTH heal from mother wounds PLUS open the floodgates of receiving from God at the same time. I’ve been doing a word study of God as our El Shaddai. I’ll explain below exactly what El Shaddai means and why it’s so important. Suffice it to say that, if we don’t know God as our El Shaddai, we are not going to be able to receive a lot from Him. Anytime you need to encounter God in a certain way, you have to know Him in that capacity first. If you need healing, you have to know God is your Healer. If you need salvation from your sins, you must first hear that Jesus is your Savior. If you need financial provision, you have to know God is your Provider. In the same way, there are a whole lot of things in life that require us to know God as El Shaddai if we want to receive. What does El Shaddai mean? Yes, you heard that right. God Himself reveals Himself to us as The Many-Breasted One. Is it because He has a lot of breasts? No; God the Father is a Spirit and does not have a physical body. Is it because He is female? NO, of course not; God is completely above the human concept of gender. GOD is wholly other. Both male and female were made in the image of God. BOTH male-ness and female-ness were derived from who God is. So why does God call Himself the Many-Breasted One? To show us who He is. To demonstrate His attributes. To teach us and help us get to know Him. Basically, when God revealed Himself to Abraham as El Shaddai, He used the image we have of a baby nursing at its mother’s breasts to demonstrate how we are to receive from God. Everything we need, we are to get from Him. He is the Giver and Sustainer of Life. Everything we need in life, we are to obtain by nursing at the “breast” of God. that we can do nothing and receive nothing unless He gives it to us. for in Him we live and move and have our being, as also some of your own poets have said, ‘For we are also His offspring’” (Acts 17:28). If you imagine the image of the vine and the branches, you can see right away that the branches are nursing from the vine–literally! Those branches have latched onto the vine. They grew from the vine; literally, the vine budded those branches! And those branches are latched onto that vine. ALL of their life-giving sap (“milk”) comes directly out of that vine. No vine, no milk/sap. No milk, no life. This picture of us nursing at God’s breast is one the enemy has tried to steal from God’s people. Remember that there’s an unholy substitute for every holy thing. And sometimes the unholy thing gets so loud that we don’t realize there’s a holy original! ALL of those are the enemy’s perverted twistings. The enemy is trying to steal God’s worship. The enemy is trying to get the worship that should be directed at God. And GOD HIMSELF reveals Himself to us as The Many-Breasted One, so the enemy took that concept and tries to present himself in that capacity, so he can steal God’s worship. And you can see how much the enemy HATES this truth when you look at how hard he has worked to pervert it through various portrayals of the demon idols mentioned above. But the enemy can’t steal God’s truth. And the truth is that God is our El Shaddai. Our Father wants us to “nurse” at His “breast” and RECEIVE everything from Him that we need–including our comfort, provision, strength, food, breath, and everything else. So let’s grab onto our revelation of Abba Father God as The Many-Breasted One, shall we? The revelation of God as our El Shaddai is HUGE. It’s a really big deal. It’s a GIANT issue. So what are some symptoms of mother wounds? 1. Inability to receive comfort. If you have a mother wound of some sort, even if you don’t realize it, you may believe God for comfort … but still not feel comforted. Even if He comforts you sometimes–and you know it–you still do not feel comforted most of the time. You feel like His comfort is far off; like He comes through for other people, but not for you. 2. Constant feeling of lack. If you have a mother wound, it’s possible that you feel like you’re always in want. Like a baby whose mother refuses to nurse or even bottle feed, you feel starved … whether physically, emotionally, mentally, or spiritually. 3. You may struggle to be merciful to others. If you have a mother wound, you may struggle to be merciful to others. Why? Because the person in your life who was supposed to be merciful to you–your mother–wasn’t. 4. Feeling like you’re unprotected, exposed, and at the mercy of the world. If you have been hurt by your mother, you probably feel unprotected. Picture yourself as a toddler who’s scared, and you’d like to hide behind your mother’s leg … but there’s no mother there. That’s very possibly how you feel. You know God is your Protector, but you feel like you struggle to actually see His protection manifest in your life. 5. People don’t tend to nurture you. When you have a wound of any kind, you will always tend to receive the same type of wound from other people until the original wound is healed. If you didn’t have proper nurturing from your mother, you probably long for nurturing, even as an adult–but you don’t get it. Rest assured: There is hope! As soon as you heal, you will see the manifestation of the GOOD thing–the opposite from your wounded state–in your life. People WILL start to nurture you after you’re able to receive it! They may not even do it consciously, and they may not have realized that they didn’t nurture you before. You will just attract nurturing. 🙂 Yay Jesus! So how do you heal from mother wounds? Here’s the first thing you have to know if you want to heal from mother wounds: Problems with our relationships on earth impact our ability to know God in all of His attributes. Such problems also hinder our ability to receive from God in all of His functions. When we have something against our human fathers, it results in a breach with our Heavenly Father. When we hold something against our mothers, it results in a hindrance, breach, or blockage between us and Holy Spirit. Why? Because Holy Spirit is our Comforter, Guide, and Nurturer. He performs in our lives (on His God-scale) many of the same functions (plus others) that our human mothers do on their human scale. To see the correlation, think of the fact that Holy Spirit is our Comforter. Comforting you is Holy Spirit’s special job. And whose human function is it to comfort a child? Generally, the mother is the comforter. 2. He feeds us. He takes what belongs to Jesus and transmits it to us. 3. He teaches us. He guides us into all truth. 4. He shields, protects, and defends us. And all of these things are things that our human mothers are also supposed to do! This doesn’t mean Holy Spirit is a woman. Again, God is ABOVE gender. But this DOES mean that, the same way we need to receive certain things on a human level from our mothers, we are designed to receive those same things from God. And when we have something against our mothers, it hinders our ability to receive these things from God–The Many-Breasted One. Do you see the correlation? It’s wild, I know. But I’ve seen it be true so many dozens if not hundreds of times, and I’ve NEVER seen this principle be wrong. It simply works every time. When we hold a grudge, anger, resentment, unforgiveness, negative expectations, etc against our mothers–even if we don’t mean to, or are unaware of the problem!–those things prevent us from receiving from God. Verbally confess to God–yes, OUT LOUD!–that you receive Him as both your Father and your mother, and that you choose right now to receive all the parenting and nurturing you need from God the Father, Jesus His Son, and Holy Spirit. Notice how people got to know Him as El Shaddai. For example, on his deathbed, Jacob referred to God asnEl Shaddai. How near and dear to his heart this name for God must have been! And as you start to get this revelation about who God wants to be to you, let it become real. Imagine yourself snuggled up to God’s chest. Imagine all the nourishment, care, provision, protection, teaching, and hugs you need flowing from God to you. Allow yourself to see God mothering you in every way you need Him to right now. Imagine El Shaddai flowing through you to nurture others, knowing that He will do the work, since He is The Many-Breasted One! Finally, remember all the times He has mothered you in the past, even if you didn’t realize it was Him at the time. Beloved, you can heal from mother wounds. 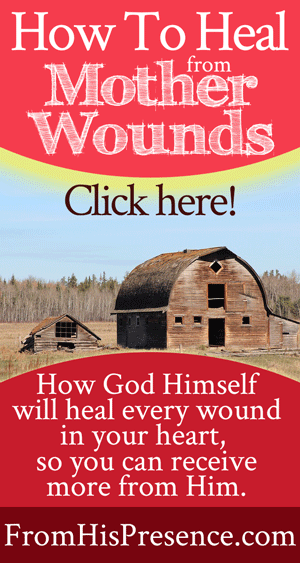 Our Lord God, El Shaddai, will heal you in every way you’ve ever been hurt. He will nurture you. He will comfort you. He will sustain you as you “nurse” at His “breast.” He will become both a Father and a mother to you, and you will be free. Will you walk through the steps? Will you forgive your mother for every way she has hurt you? Will you receive God’s truth and let Him take the place of your earthly mother? If you will, your life will be transformed, and God will use you as a vehicle of healing to the people around you too. Does this word about El Shaddai and healing from mother wounds speak to your heart? If so, please share your thoughts in the comments below! I love to hear from you! Thank you Jamie! I thank God that He gave my siblings and I the time to make things right with our Mother. She in turn did the same for us! My wounds were healed and so were my siblings. Please pray for me that God will heal me from the from the way my parents passed away. I have moments when I think about them and it is not easy. I thank you in advance again for your prayers! What a powerful revelation! For me this is a direct answer from Daddy God to what I have been seeking from Him recently. Thank you for listening to Him and sharing. Linda, I’m so glad this helped. I apologize for taking so long to respond–I’m just now starting to get back on my feet after being sick. But this topic is really strongly on my heart for many and I prayed for you today. Yes, yes, yes. He WILL love you back to wholeness as He nurses you at His “breast.” He will give you the sustenance and comfort you need. I pray He’d minister to you in a special way today as your El Shaddai. The Apostle John understood this concept too. I know it is a strange concept to some believers as is the intimacy, but this is beyond physical and human relationships,, it is perfect love. It not new age, but coming of age, no longer needing milk but the meat of the Word and the Holy Spirit is the teacher. This is so timely, thank you. Revisiting this issue with the Lord for a deeper work. Know I am called to be a mother in the church and yet it is the one area I feel so weak in. Letting Holy Spirit go deeper and so it will be His work not mine. Thank you for the scriptures to meditate on. Jane, if you ask Him to give you His heart for people, I’ve found He’ll help you love them more deeply and easier–and unconditionally. Being a spiritual mother is definitely hard, but it’s so fulfilling. I pray He’d pour more of His heart into you than ever before so you and He can co-labor together in this effort, and that you’ll impact many lives. I actually dreamt the previous evening that my dad and I were looking for my mum as she did not return home! (she and my dad died 12 and 14 years ago! being in their 80’s) Today I stumbled across this article! God is surely saying something to me here! I sometimes feel these symptoms you describe here, even being in my 50’s and serving the Lord! Many blessings! Praise God for your faithfulness! 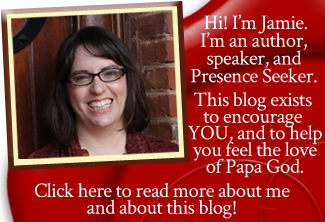 Prior to stumbling across your blog, the Lord would give me pieces of what was going on in my heart, but I never could fully understand it. Your blog put soooo many things into perspective. I was able to cry out at the feet of Jesus. Please pray and believe with me that this root of rejection, neglect, abandonment, and self rejection has been dismantled in Jesus name, and that I’m walking TOTALLY FREE! Dear sister, this is a wonderful testimony. I am going to share it with our community! I praise God for helping you. He ALWAYS wants to heal and restore! He loves you so much and I know He will keep leading you. I prayed for you also. Yes this most certainly touches my heart. I never could figure out why there always seemed something blocking me and Holy Spirit. I have mother wounds. Thanks and tons of love for sharing this information! I have always felt like there was something wrong with me. Now through you I’ve discovered it’s from Mother wounds. Thank you so much for this teaching about El Shaddai. I’ve never heard of that before. You are such a rich blessing to the body of Christ. May you know NO lack in 2018 and may your precious baby boy be completely healed in Jesus name! Amen! Dear Jamie early last year God said to me,” Ask Me to let you know Me as El SHADDAI,” I asked not knowing why but chose to go into my bible to see why, where and to whom He first appeared to as El SHADDAI. That same week He said,” Ask Me to bridge the gap between your mother and you. Ask Me to let every wrong done to your mother be paid for by Jesus. Ask Me to let every wrong done to you be paid for by Jesus” I did two months later my mum fell terminally ill and had to take time off to go and look after her. I had heard ,” I want you to go and look after your mother,” I quietly began to pack my bags , apply for leave and went home by His grace to look after her. I got home at midnight. The next day she looked at me and wept, ” It is you the one I least stood by who came to look after me.” In the presence of all she said looking into my eye’s deeply, ” Deola I am sorry, do you understand,” Jamie I lost her two months later. Thank you for speaking to me today. I am grateful. El SHADDAI let my healing begin as You have purposed. Amen. Love all your posts ?